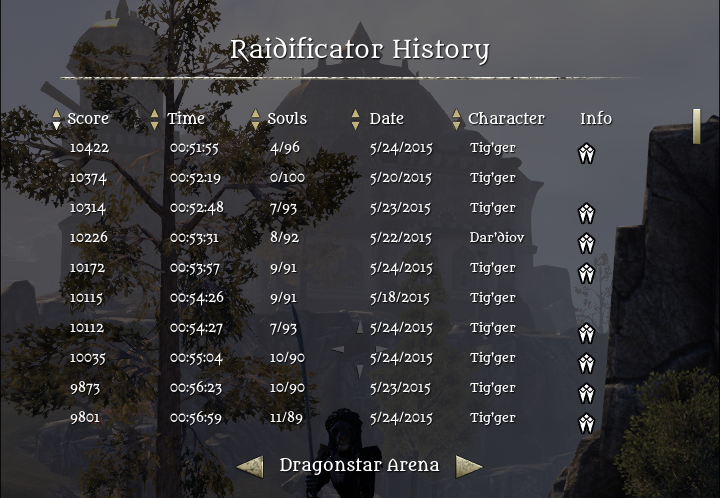 > Raidificator is a add-on which will show you your current time, score and remaining vitality bonuses in any ongoing trial event. Once a trial is successfully completed, it will store the information which you later can view in the history window. Only visible when you're actively participating in a trial, will show you the elapsed time, remaining vitality bonuses and current score. The history window will let you select a specific trial and see your archived runs. Within each recorded trial you can see which players were within the group by clicking on the group icon to output a log to your chat window with the player names. Feature requests are welcome, if you happen to have any please leave them in the comment section. Hi, I've been using Raidificator for quite some time now and only just realised that I can click on the team icon for it to post the names of all the characters that were in that raid. Would it be possible to make an option so that it posts @names instead of character names? Sorry for the late reply, I'm not supporting either of my addons at this time since I don't play the game any longer nor do I have it installed at this time. If I get back to it one day I'll make sure to implement your request. API version bump update for Dark Brotherhood. Hi, thank you for creating the Raidificator addon! Since you have not yet had a chance to update it for Thieves Guild, I went ahead and made an updated version. I have a copy that I have uploaded to ESOUI as an "optional file" for Raidificator. * Updates for Thieves Guild: added support for Maw of Lorkhaj, updated icons, and various updates for the new vitality system. * The chatbox messages now show the par completion time for the raid and whether your final time is above or below that time. * I think I've fixed the problem with the nil errors, and I have also refactored/simplified areas of code to improve reliability. Feel free to incorporate any or all of these changes into your next release. And thanks again for creating this addon. Last edited by code65536 : 03/22/16 at 07:47 PM. Thanks for the feedback guys, glad you're liking the addon. I've added the possibility of locking and toggling the visibility of the main ui by using slash-commands. - "/rcr lock" will lock the position of the UI, it will be stored as a setting so once you lock it it will remain locked until you type the command again in order to toggle it. I will eventually add more settings, once I do I'll ensure that there will be a UI for all available settings instead of using commands by using LAM, the most common library for addon settings. to toggle locked/unlocked on screen for its window, would be extremely handy standard additions . Amazing addon. Thanks Olivierko it is awshom.